We’ve got to remind all these senators, including Diaz that we can unseat if they vote against equality. This is our state, the bigots are on our territory, so lets make them worry about getting rejected if they vote for hate. Please give them a call, and let them know that a vote against marriage equality is sending a message that you don’t think that gay and lesbian families need basic respect. So the previous one didn’t really work out, so I redid it, and here’s the video. Its my first proper attempt, so please be kind. 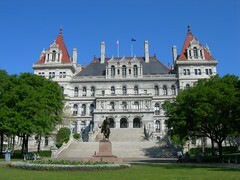 We’ve got one guaranteed vote to go in the state senate before marriage equality can become legal in the Empire State. Last time we thought we were so close, but we were betrayed by the democrats. I thought rather than writing something, I’d say something and here it is. The assembly has voted for marriage equality, its now up the state senate to do the same. Here’s the numbers for the senators who are considered “In Play” by those lovable scamps over at NOM. If you are in NY please give them a call and ask them to stand up for marriage equality and justice for all New Yorkers.